Tonight one of the forgotten Canadian rivalries took to the ice to do battle with the Montreal Canadiens taking on the Ottawa Senators. The Senators without Spezza and Gonchar the Canadiens without Pacioretty and Subban both clubs came out with high energy and a little bit of a chip on their shoulders with 38 pims in the first period alone. A few off-setting penalties and two fights show that these two teams came to play and were willing to do anything to gain some sort of edge or momentum for their team. It was soon after Tomas Plekanec’s power play marker and fourth goal of the season (second in as many games) that put Montreal in front that we saw Chris Neil and Brandon Prust drop the gloves and battle to a draw. Assists on the play went to the usual suspects in Markov (4) and Diaz (8). Just as we saw in last night’s game between the Habs and the Jets after a Montreal goal came a fight and soon after there was a goal for the opposition which is exactly what transpired tonight as well. Less than two minutes after the Neil and Prust tussle Jim O’Brien beat starting goalie Petr Budaj with a trickler through traffic to tie the game at one. Assists credited to Karlsson (4) and Condra (2). 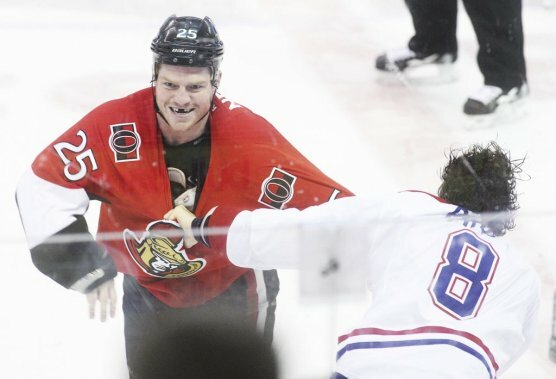 It was penalty trouble in the second period that cost Montreal when Ryan White was called for a double minor and Ottawa made them pay twice with Daniel Alfredsson potting his first from Wiercioch (3) and Turris (3) as well as Mika Zibanejad scoring his first career NHL goal from Greening (2) and Benoit (2). All of sudden the Sens have taken control and did not look back as they scored once again less than two minutes later with Chris Phillips letting one of his bombs go for his second of the season. Assists credited to Smith (2) and Greening (3). With three goals in less than four minutes Ottawa secured a strangle hold on the Canadiens and for the remainder of the second frame maintained possession and momentum heading into the third period. After a sloppy second period and I use that term to its fullest extent Montreal was in dire need of a spark. Not so much to try and climb back into this game but to at least be prepared for their upcoming game. Sadly this did not happen as Montreal was either chasing the puck or scrambling to get anything going. Erik Cole and Brandon Prust were seen hustling as well as Diaz however being down 4-1 going into the final period does not really give you much to get amped up for. When Montreal did generate chances their shots were either blocked or off target and when it came right down to it they were not getting any bounces to go their way. Capping off the game was a goal by Chris Neil that probably would not have crossed the line had he not moved but that was the kind of night it was for the Habs. There was bad bounces, no bounces, penalty trouble and running into a hot goalie; recipe for disaster if you ask me. Starter Craig Anderson had some luck on his side while turning aside 31 shots in tonight’s 5-1 victory. I know it is early to say but as of this moment he would receive my MVP vote, there is no goalie in the league as hot as Anderson is right now. Up front for Ottawa they received production from up and down the lineup and played sound defense when it mattered to preserve tonight’s victory promptly ending Montreal’s four game winning streak. Every team is due for a stinker now and then so for Montreal getting one of them out of the way now may be helpful moving forward. 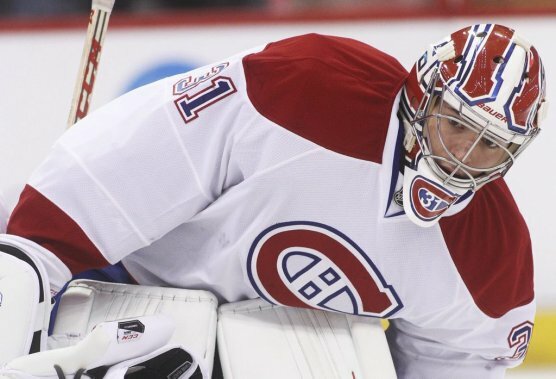 Although a few goals were not exactly Budaj’s fault one would have to think we will see a whole lot of Carey Price in the near future with the next five games coming against divisional rivals. Up next is the Buffalo Sabres in a Saturday matinee where Montreal will look to bounce back from tonight’s less-than-stellar performance. Will Subban make his debut this Saturday? Will David Desharnais finally channel the skill we all know he possesses? Nice job, it’s a superb post. The facts is good to grasp! I wouldn’t mind publishing a post or elaborating on a number of the subjects you write with regards to here. Again, awesome blog!